Since the advent of globalization, the business and economic growth has replaced the conventional power tools, i.e. military strength, weapons, number of soldiers, etc. Today the countries of the world are recognized and considered powerful in terms of their economic strength and global business accumulation. That is why the global surge towards the attainment of business and economic goals is associated with the quality of management and economic policy design. The last few decades have seen proliferating growth in business and management education. The candidates produced in these systems are now running the business empires which rule the world. In precise, business education and management research has been playing a vital role in innovating businesses and management practices. It further expands the businesses with minimized risk and results in a larger success ratio. Nevertheless, Pakistan has also been striving for imparting the quality of business education and research since its inception. Numerous business schools are working on producing business graduates to meet the growing demand in the developing economy. The institutes are engaged in understanding the domestic business requirements with its compatibility to global markets and vice versa. Therefore, Sukkur IBA is also aimed to establish to meet such requirements with international standards. The institute has distinguished itself among the best schools in the country in a very short span of time. Now it ranks 3rd best business school in Pakistan. Realizing the responsibility and long term vision, Sukkur IBA is now focusing the business and management research. 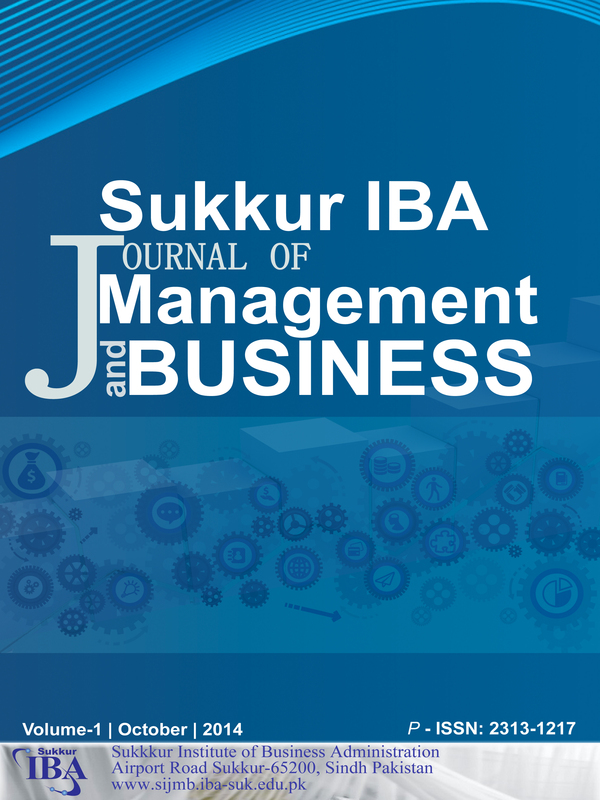 After holding a very successful international conference (ICOBM-2014), we proudly brought the first special issue of our newly established Sukkur-IBA Journal of Management and Business (SIJMB). The special issue is composed of selected papers from the conference proceedings. The frequency of the journal is initially set to semi-annual. The journal is a sincere effort of Sukkur-IBA’s unmatched contributions towards business education and research. SIJMB is aimed to produce high quality original research articles, case studies, review articles and short essays on any of the journal’s thematic areas. The Journal will be indexed in highly ranked services and aim to get recognized on an international level. I look forward to receiving your submissions and feedback.